The stadium opened at 5:05pm. I don’t get nervous anymore at Shea Stadium. My heart might beat a little quicker as the gates open, but it’s more adrenaline than anxiety because I know that I won’t be going home empty-handed. Even though I’d snagged at least one ball at each of my last 97 Yankee games, there were plenty of times–21 to be exact–when I’d only snagged one. There’s no guarantee at Yankee Stadium. The average attendance is 50,000, and it’s almost impossible to get to the dugouts. On top of that, Yankee fans are savages. I was the first fan to enter the ballpark, and I raced through the concourse and runway and into the right field seats. With a huge crowd behind me, I knew I’d only have the section to myself for a few seconds, so I quickly looked for loose balls. A minute later, the narrow aisle behind the outfield wall was nearly full. The batter hit a ball to the warning track. Yankees pitcher Ron Villone started walking over, and everyone jostled for position. Villone flipped up the ball without looking. Everybody else reached. I jumped and plucked it out of the air with my bare hand. The next one I stole was from the Yankees. Bernie Williams was taking fungos in right field and missed an in-between hop. The ball rolled to the wall, and I got it with my glove trick. Less than a minute later, I caught a Johnny Damon homer. I had to wait for the opportune moment to sit down and label my last two balls. If I’d labeled the first one right away, I would’ve missed the Damon homer. “YOU’RE the baseball collector? !” another fan asked. I ended up posing for a photograph with the father and his kids. No one asked for my autograph. …but the concourse was empty! The ball ricocheted off a garbage against the back wall, and I was all over it. A policeman poked his head out around a corner. Back in the seats, I came close to several home runs. 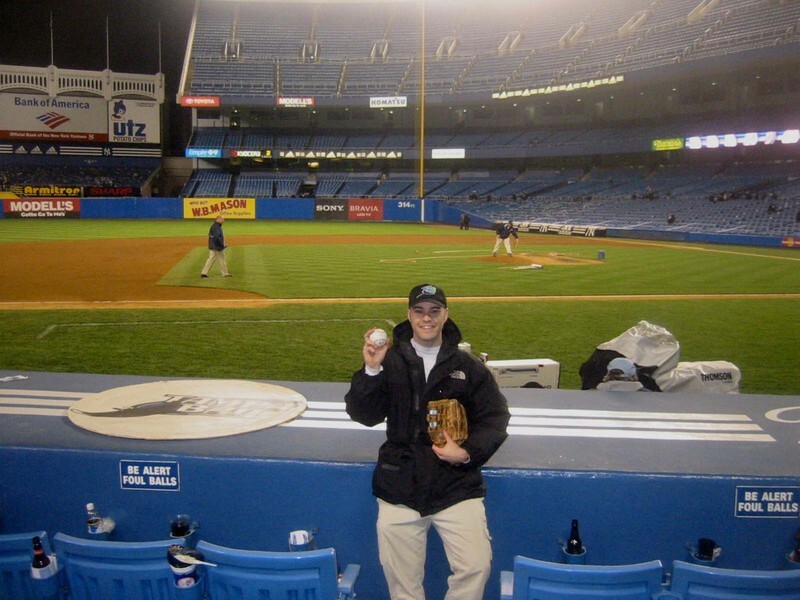 On one of them–a rocket by Hideki Matsui–I raced through the aisle and reached up and to my right to make the grab when some monster of a fan stuck up his glove at the last second and caught the ball six inches in front of me. That hurt. Gomes hadn’t seen me use the trick, so I was able to get another ball from him two minutes later. I was at the far end of the section, close to the bleachers in straight-away right field. Gomes underhanded the ball from about 50 feet away, and I could tell right away that it was going to fall short. I jumped up, hung halfway over the slanted concrete ledge, reached way down over the wall (into that alley type area where the ambulances park) and made the catch. That was number seven. Moments later, I would’ve had an easy chance to use the glove trick again from that corner spot, but a fan had quickly taken that spot when I stepped away, and he wouldn’t let me in. I went away…and used my glove trick elsewhere. Then I used it again. I couldn’t believe that NO ONE else had their own trick. I couldn’t believe that security had no problem with mine. I couldn’t believe that every time a ball rolled to the wall, the Devil Rays just left it there. I couldn’t believe that I had just broken my one-day Yankee Stadium record with 11 balls. I hadn’t gotten to label my last four balls because I’d gotten them all so quickly. I put the first of the four into my right pants pocket, the second in the left, the third in my right jacket pocket, and the fourth in the left. I don’t think I’ve ever been four balls behind, but because of my pocket pattern, I was able to remember which ball was which and write the appropriate numbers on them after BP. The grounds crew did their thing, and eventually, half a dozen D’Rays came out to run and stretch. If I could’ve gotten down to the dugout, I would’ve gotten a ball from Tomas Perez, but instead, I had to go all the way down the 3rd base line, where there wasn’t much action. 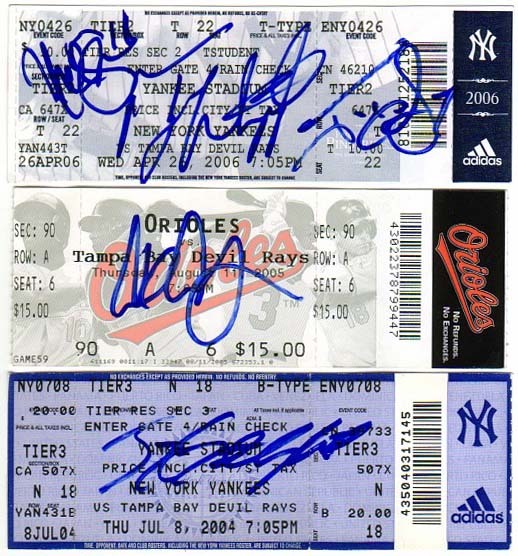 I did, however, get five autographs: Nick Green, Ty Wigginton, and Jonny Gomes on that day’s ticket stub…Carl Crawford on an Orioles-Devil Rays stub from last year…and Joey Gathright on a Yankees-Devil Rays stub from 2004. Earlier in the day, I’d been thinking about sitting near the foul pole in the right field upper deck. It’d been empty there the night before, and I was willing to lower my odds of getting a game ball in exchange for having that potential ball be a home run. But now that I had a record in progress, I didn’t care what kind of ball I got. I just wanted ONE more ball to extend my record and undo the pain and sorrow from having missed those two balls at the end of BP. Naturally, I decided to go for foul balls. I just had to pick a side of the stadium. First base for righties? Third base for lefties? At Yankee Stadium, there’s no running back and forth. It’s too crowded, and security is too strict, so I paid close attention as the starting lineups were announced and counted the lefties on both teams…Carl Crawford, Tomas Perez, Travis Lee, Joey Gathright, Johnny Damon, Jason Giambi, Hideki Matsui, Jorge Posada, Robinson Cano, and Bubba Crosby. That was 10. That meant there were only eight righties. There’d be more foul balls hit to the 3rd base side, so I chose a seat on that side of home plate, just behind the main aisle. In the bottom of the 2nd, Cano fouled off a couple pitches to work the count to 2-2. Normally, I sit on the edge of my seat in anticipation, but before this next pitch, I just felt something. I can’t really describe it. All I can say is that I knew he was going to hit one my way. It was like some weird sixth-sense thing. The ball flew 40 feet over my head, hit the facade, and dropped right into the aisle. I would’ve caught it on the descent, but my path to the aisle was blocked by a couple of vendors. (I couldn’t predict THAT.) The whole event seemed to play out in slow motion–I knew where the ball was going and watched helplessly, blocked by these vendors, as it floated to the ground. To everyone else, it must’ve seemed like the ball shot back and slammed down in the blink of an eye because no one else was even out of their seats. Luckily, when the ball hit the concrete aisle and bounced back up, it clipped the back of the seats in front of me and settled at my feet. I had my 12th ball of the day. “Nice catch!” said a lady who passed by moments later. The fan across the staircase asked to see the ball, so I handed it over. “How do you know that!” he demanded. The fan behind me asked about the ball, then about me, and I briefly told him about my collection. “You should be on TV,” he said. I really thought I was going to get another foul ball. It was only the 2nd inning, and the game was crawling along. McClung was throwing lots of pitches. “More opportunities for me,” I thought, but nothing else came my way. I really wanted the Yankees to lose. I mean, I pretty much always want them to lose, but it was especially important on this night. After games, it’s always easier to get a ball at the visiting team’s dugout–that is, if the visiting team wins–so I was bummed when Gary Sheffield tied the game at 2-2 with a two-run homer in the bottom of the 5th…and that’s how the score remained through nine innings. I love Mariano Rivera. He’s one of the few Yankees that I will absolutely never EVER root against, but let’s just say that I didn’t exactly mind when the Devil Rays scored two runs off him in the top of the 10th. In the bottom of the frame, Posada drew a leadoff walk, Cano and pinch hitter Bernie Williams struck out, and Damon walked. Mr. Clutch–that would be Derek Jeter–then followed with a single to load the bases and bring up Sheffield. It was very exciting. Two outs. Bottom of the 10th. Bases loaded. Tying run in scoring position. Shawn Camp on the mound?! Almost didn’t seem like a fair matchup. I was all set for Sheff to end my night with a three-run double to left-center, but instead, he grounded out to Wiggy at 3rd base. Game over. I bolted down the steps toward the dugout, fighting my way past the dozens of fans who were making their way out. (Silly people.) The Devil Rays gathered near the mound, slapped hands, bumped fists, patted each other’s arses, and made their way back. The unused relief pitchers were slowly making their way in from the bullpen. 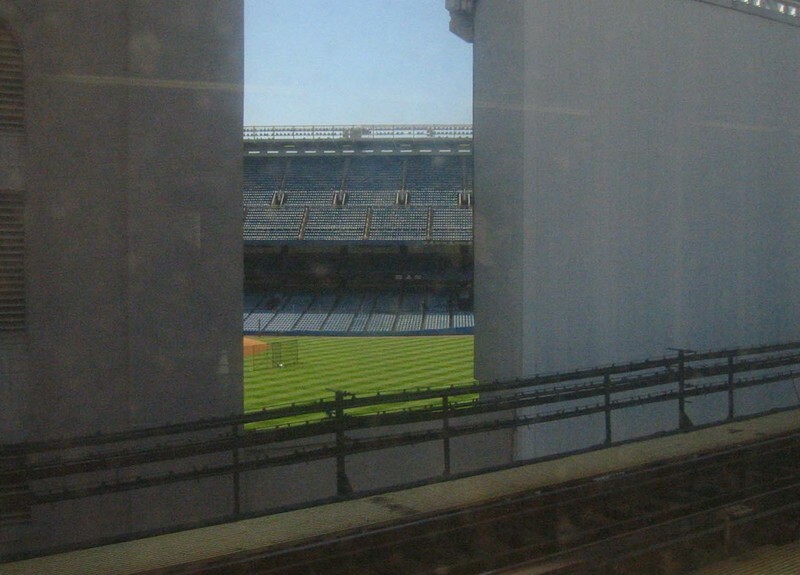 At some ballparks, they go from the ‘pen to the clubhouse via the underground concourse, but in the Bronx, they just walk across the field. Finally, Yankee Stadium was doing something for me. The seats behind the dugout were nearly empty by the time Scott Dunn approached. Actually, I didn’t know it was him at the time, and I wasn’t sure if he even had a ball, so I made a generic request. It worked. He did, indeed, have a ball tucked inside his glove, and he tossed it to me. THIRTEEN! “Bobby!! Bobby! !” I shouted as he approached the dugout. He looked up, pulled a ball out of his back pocket and flipped it to me. 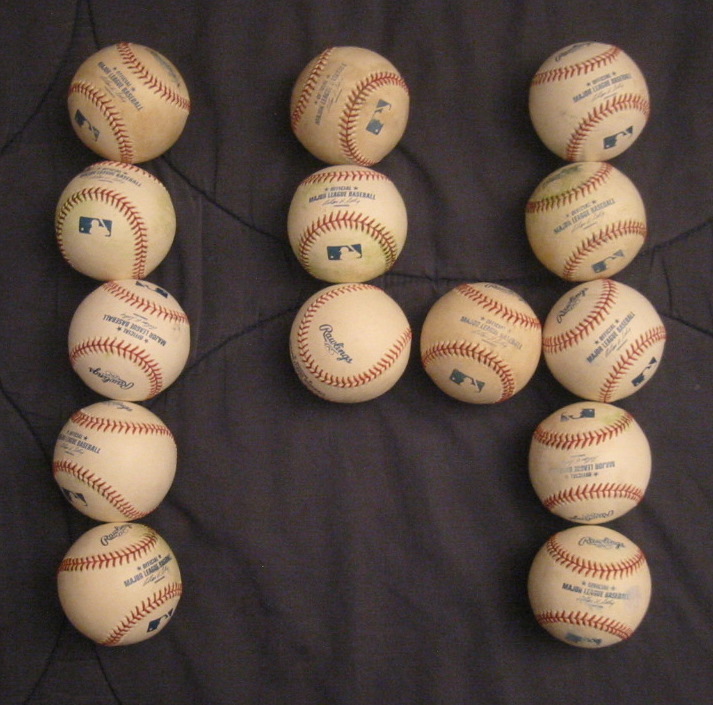 • 14 balls = a new one-day record for Yankee Stadium, breaking my old high of 10 on May 10, 2005. • 33 balls in 4 games this season = 8.25 balls per game. • 2,785 total balls moves me into 44th place on the all-time hits list ahead of Andre Dawson (2,774). Next up is George Sisler (2,812). Nice! Maybe security has been lighter this year for the Yanks. You should go back again if that is so. Sweet uve got the greatest luck!!! You should definitly go back for more!!! The Cano foul is the amazing part. You’re a regular celebrity now eh? That show was some nice RP. Oh also, congrats on the amazing yankee day. Really, its like 20 balls, considering the stadium. Give yourself a pat on the back. By By the way: I got Seth McClung’s auto on an extra baseball on opening day this year. Nice guy. As for the “ladies man,” factor, I won’t claim to be Mister Stud, but it’s always funny when those idiot radio hosts interview me and then make fun of me for being a big dork. I’m always tempted to say: “Um, actually, I probably get more than both of you guys combined.” Hmm, maybe next time I WILL say that. Thanks. It did feel pretty darn good when all that planning paid off. No, I’m not a REAL celebrity. Like I said, no one asked for my autograph. But it’s nice to get a little recognition every now and then, and it’s even nicer when that recognition can then help younger fans to get some baseballs for themselves. I was watching the Yankees game, so I missed the great catch by the fan, unfortunately. But man, that sounds amazing. Maybe it was good enough to make it on SportsCenter? Cool about McClung. He was in his own world last night, you know, to get ready to pitch, so I didn’t have any contact with him. That’s too bad… he was really friendly on opening day, I talked to him for a while about the new manager, Joe Maddon. Seth says he likes Joe a lot. Although, when I asked him who he likes better, Sweet Lou or Joe, he had no comment and just smiled… I ended up getting Maddon to sign on the sweet spot, so hopefully it will be worth something one day when Maddon leads the Devil Rays to the AL East title! Is your all time goal 4,257 balls? Very cool that you got to talk to McClung in depth. I don’t blame him for refusing to name his favorite manager. That could get him in serious trouble. I would love to catch Rose someday, and I’m willing to bet that I’ll succeed. It’s not my ultimate goal, though. It’s just something far off to shoot for, but once I get there, I have no doubt that I’ll keep going. How about 5,000 balls? Now THAT would be something. Realistically… I give Maddon until the All-Star break. 5,000 balls would be amazing. You would need an entire room devoted to storing baseballs, though. It could be another 10 years until you get to 5,000… do you plan on doing this into your late 30s and into your 40s? Would players still give balls to you after that long? They would have to start recognizing you, at least in New York. Yeah, I’m sure it would take at least another decade to reach 5K. At some point, I have to slow down, right? Or maybe not. I WOULD like to have season tickets someday and attend all 81 home games (of whatever team…probably the Mets), so who knows. Maybe it won’t take that long after all. I hope I’m still collecting balls when I’m in my 90s. I mean, as long as I’m alive, I’ll love baseball, and as long as I love baseball, I’ll attend games, and as long as I’m attending games, I might as well bring my glove and show up early for BP. Players change teams and generally have bad memories. I’m not concerned about that. Someday, I hope to get charity balls by being the OLDest fan. Psh, slow down?! You aren’t even in your prime yet! Barry Bonds didn’t hit his “prime” until he was 37! That’s when Bonds started using flaxseed oil. 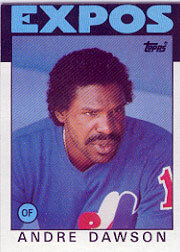 That’s when Bonds *unknowingly* started using flaxseed oil. Dude.. how? how in the world did you get that many balls in that game? I was at that game, in fact I’m in new york this week and have been in Yankee stad all week. I had awesome seats, 4 rows behind the Yankees dugout. I tried my best getting a ball, but I couldnt attend BP and got shut out all game long. I’ll e-mail you pics of the game I took when I get home saturday. Awesome day! Beyond the 2,509 words that I wrote about the game, I can’t explain it. The glove trick certainly helped, but beyond that, it was just a matter of knowing the stadium and the players’ tendencies and planning carefully and trying to stay several steps head of everyone else. It doesn’t always work quite this well…this was just one of those days…and yet I’m kind of disappointed because I feel like I should’ve had 20 balls. But YOU…four rows behind the dugout and still nothing? 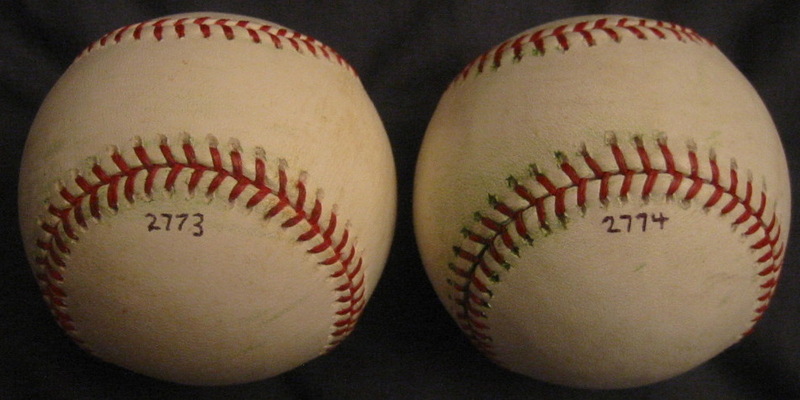 What about all the balls that the Yankee fielders tossed into the crowd after 3rd outs? Send me some pics. I’d love to see what The Stadium looks like from the fancy seats. I’m glad I could get you the hookup for #14. Like you needed my help, my goodness, what a day. I do remember a day like that for me last year, at the AA All-Star game in Frisco when I got 10 balls. Everything goes your way. That day, a dude threw me a ball while I was waiting outside of the stadium! Glad you had a good day, and glad I could help. OH, did you use your Spanish with Bobby? Probably didn’t need to, he was amazed anyone knew a .190 lifetime hitter! You totally get the assist on that one. Thank you! I’m not sure if I would’ve gotten the ball if I hadn’t known his name. It’s possible that I would’ve, but knowing who it was basically guaranteed it. No Spanish necessary. I shouted his first name, and that was it. I remember your account of the Double-A All-Star Game, and you’re right. Sometimes, you go to the ballpark and EVERYthing seems to work out (although I *still* feel like I should’ve—or at least could’ve—caught 20 balls). 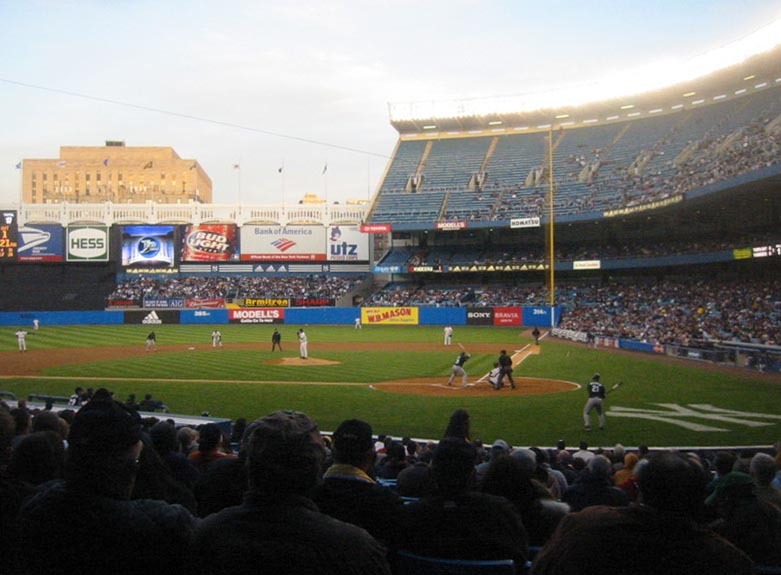 … you conquered Yankee Stadium, completed a feat millions of fans can barely even dream about, and, by your own admisssion, enjoyed a great day at a ballgame doing something you love. Maybe you should think about this the way one must think about life: some of it’s positive, some not. To achieve maximum happiness, it’s probably wise to focus on the positive and let the other stuff go. Bottom line: you done good, You Da Man! Embrace it! Well then Zack, looks like you’re gonna have to catch up with Greg Anderson after he is done being on trial with the Grand Jury. Good luck on the rest of the season. Zack-just saw it. it was pretty sweet. your dad is so cool. I missed myself on TV today…and I’ve been home all afternoon. Duh. I’m glad you got to see it. Both of my parents are cool, though my dad tends to steal the show. I’m not going to agree or disagree with you about Amanda. if I say she’s good looking, that makes me a perv. If I say she’s not good looking, that just makes me rude. So…yeah. The end. I’ll never touch the stuff. I want to keep living asterisk-free. The dumbest thing about the Yankee fans was that they were booing A-Rod all night long. The guy might go down as the greatest player of all time, and he’s the reigning American League MVP…and he goes 0-for-4 and gets booed because he left a few guys in scoring position. Unbelievable! Everyone who booed him should be banned from Yankee Stadium. Just found out that in this game, the Yankees became the first team in 52 years to draw 14 walks and score just two runs.